1. 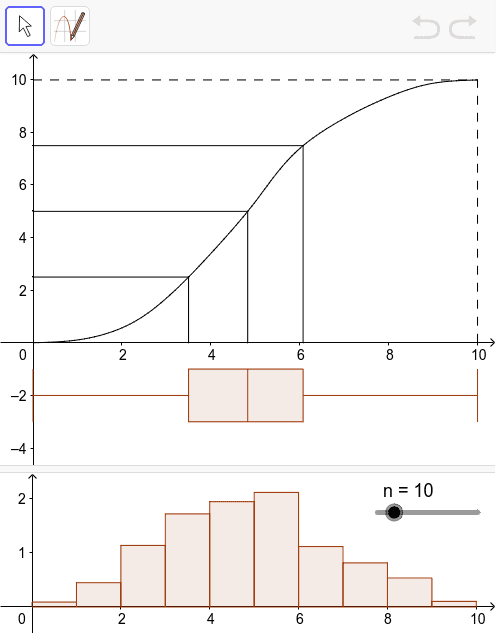 Select the pen tool from the tool bar and draw a cumulative frequency curve on the top axes free-hand, thus replacing the existing one (Note: The curve needs to start and finish in the same place as the existing one) The bar-chart and histogram will be automatically updated to be equivalent to the curve. 2. Adjust the slider to select the number of groups for your histogram. How could you draw a distribution with positive/negative skew? How could you draw a distribution with large/small inter-quartile range? How could you draw a bi-modal distribution?